SIX TEENAGERS WHO are former residents of ‘The Jungle’ migrant camp in Calais have arrived in Ireland this weekend. 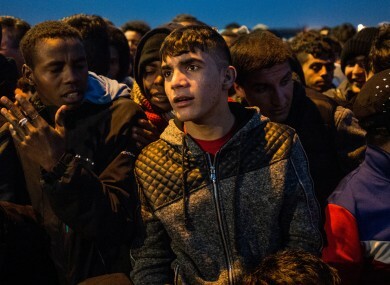 These young people have been separated from their loved ones by the migrant crisis. Their arrival brings the number of separated children and minors affected by the migrant crisis who have been welcomed to Ireland to 25. 21 were accepted from France and four young people arrived from Greek camps. The Department of Children and Youth Affairs said the six teens who arrived this weekend are bring cared for in small residential units with the support of experts from the child and family agency Tusla. “Warlords, terrorists and thugs have put children in the frontline of this crisis. Young people have been bombed, gassed and forced to flee across continents and oceans to safety.,” said Katherine Zappone. Ireland has a duty to respond. This was made clear not only by a unanimous Dáil motion last November, but also by the repeated calls from the public for action. Children who have become separated from or have lost their families are particularly vulnerable, this became evident from the accounts of Irish volunteers at the Calais camp known as The Jungle and again when I visited camps in Greece in December. Responding to their needs is a priority for my department. Zappone said those who have arrived in the past few weeks are settling in with the support of specialist social workers and social care workers. They have access to education and training and are also being offered opportunities to become involved in skills, sports and hobbies. “As Minister I want to acknowledge the work of Tusla social workers in identifying, assessing and supporting very vulnerable teenagers – firstly in Europe’s camps and reception centres and then in helping them restart their lives in Irish communities,” she added. Email “Six more teenagers from 'The Jungle' migrant camp arrive in Ireland”. Feedback on “Six more teenagers from 'The Jungle' migrant camp arrive in Ireland”.